When God laid out the plan for your life, He provided everything you need to fulfill your destiny - the right people, the right breaks, the right timing. What He has coming your way is going to be more than you imagined. In this 3-message CD/DVD resource, get ready to receive all that God has in store for you today! No matter what you are facing, God desires for you to come out better than before. He has already given you the victory through Christ. In this encouraging three message resource, discover how to live a life filled with God's goodness and blessings. Begin to declare His promises over your life and over every difficult situation you are facing. God has victory waiting for you today. In this 31-day audio devotional, Joel Osteen speaks an uplifting declaration over your life every day. You'll discover how much God loves you and the wonderful plan He has for your life. When God laid out the plan for your life, He provided everything you need to fulfill your destiny - the right people, the right breaks, the right timing. What He has coming your way is going to be more than you imagined. In this 3-message USB resource, get ready to receive all that God has in store for you today! In this 4-part resource, Joel Osteen shares how to overcome challenges and experience God's best by trusting at a deeper level, dreaming bigger and imagining through the eyes of faith. Instead of becoming discouraged by life's circumstances, you can be equipped to win in every situation and experience God's best every day. 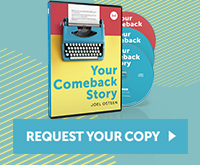 In these inspiring messages on CD/DVD, Joel helps you celebrate even the small victories and live without guilt and shame. Get ready to experience a new level of freedom and expectation as you rise above! it's great to have faith for tomorrow, but God desires you to have faith now. In this encouraging 3-message resource, Joel Osteen helps you develop a mindset of faith and expectation. Now is the time for God's favor and goodness in your life. Get ready to be blessed. Be encouraged to pursue what God has placed in your heart. Instead of focusing on the circumstances and disappointments in life, you’ll be inspired to get prepared for your “yes” and for the wonderful plan God has in store for you! Right now, the winds are shifting in your direction. God is changing your circumstances for the better. In these inspiring messages, Joel helps you see how the goodness of God is covering you more than you could have ever imagined. Get ready to experience favor in your life in a brand-new way. There is a God-given destiny inside of you that is waiting to be unleashed and revealed. You are an amazing and unique creation of God. You have something to offer this world that no one else can. Get ready to see doors open and your dreams fulfilled. Be encouraged daily with these short, inspiring devotionals. As you listen for 28 days - about 7 minutes each day - you'll be encouraged and inspired as Joel shares practical guidance for your life. The goodness of God is yours today. Take the limits off of Him and experience all of the wonderful things He has in store for you. In this special, 4-message resource, Joel helps you see how God wants to bless you, give you favor, and wants you to live healthy, whole and free. How Big is Your Want To?